Does everyone realize there was a military coup in Thailand this last week?! On Tuesday, Thai General Sonthi Boonyaratglin rolled up to the capital in Bangkok with five tanks and overthrew Prime Minister Thaksin Shinawatra, who was in New York preparing for a U.N. speech at the time. After gaining control, the general tossed out the constitution and declared marital law. 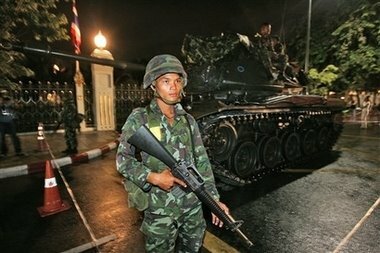 According to the BBC, "The coup followed months of growing tension in Thailand, with protests against Mr. Thaksin and a general election which was annulled due to concerns about its legitimacy... Gen. Sonthi has said he was acting in line with the wishes of the Thai people, accusing the old government of corruption and fostering divisions in the country." Now, the non-violent, bloodless coup has become a huge tourist attraction. According to the AFP, tanks have been decorated with ribbons and flowers, local travel agencies have organized bus tours of coup sights and vendors are already selling coup t-shirts. "It's cool to take pictures next to tanks. I will definitely bring my kids here this weekend to take pictures with soldiers," said Sinsak Jiarasincharoen, a 43-year-old businessman.